LOS ANGELES – The Los Angeles Kings have signed unrestricted free agent defenseman Jamie McBain to a one-year contract, Kings President/General Manager Dean Lombardi announced today. The 26-year-old McBain (born on Feb. 25, 1988) is a 6-1, 181-pound native of Edina, Minnesota who has appeared in 275 career NHL regular season games with the Carolina Hurricanes and the Buffalo Sabres over five seasons, totaling 92 points (25-67=92) and 62 penalty minutes. McBain was originally selected by the Carolina Hurricanes in the second round (63rd overall) at the 2006 NHL Draft. He will wear number five for the Kings; he becomes the 19th player to wear the number (last King to wear number five was Keaton Ellerby; 2/13-11/14). "It’s kind of been a crazy summer in a sense, I mean just kind of bouncing around, going to Arizona camp, leaving there, not knowing where to go, and coming to Manchester and getting this opportunity, so it’s kind of been definitely a crazy few weeks." Read More from McBain on LAKingsInsider.com. 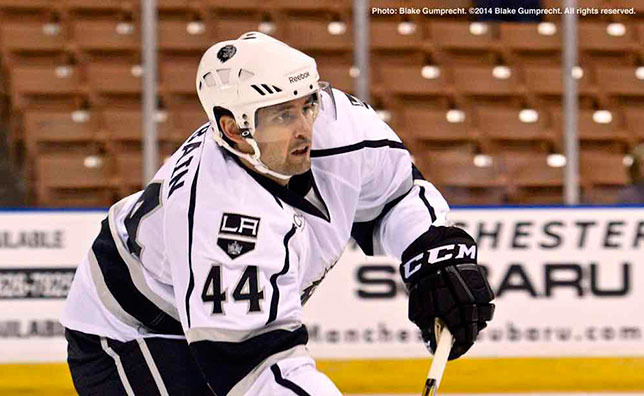 In order to fit McBain on the active roster, Slava Voynov has been designated as a non-roster player for the Kings.